Open Your World to Refreshing Profits with Heineken! Another week, another prestigious supplier we are teaming up with. Take advantage of exclusive prices on beers to help your customers keep cool throughout the unpredictable weather conditions! The masters of brewing are getting warmed up for upcoming football events this summer and a great drink to stock up on would be Strongbow, since it has been targeted towards the younger generation with a mobile-first campaign that focuses on social gatherings, such as the ones your customers will be having as they are enjoying the football with their friends. 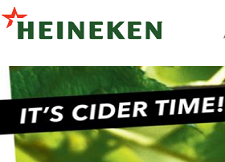 Furthermore, Heineken encompasses international beer brands such as Fosters, Kronenbourg, Dragon Stout and Desperados to give your customers a taste of global flavours. These brands are all included in this weekly special, so what are you waiting for? Grab them now! 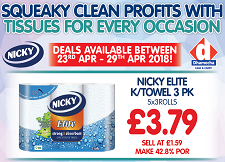 This week, we have teamed up with one of the highest growing tissue brands, Nicky, to offer great deals that will keep shoppers equipped for all occasions. What’s more, they have introduced new packaging to show more of the products, so that customers can look at the superior quality of the tissue they are buying. Because there are growing demands for a single mono roll, Nicky have decided to introduce a single multipurpose version to cater for all areas of the home. It is vital to bear in mind that Nicky continues to grow within the convenience sector by 16.1%. Therefore, grab these handy tissues now to experience squeaky clean profits with one of our favourite brands! This week Mondelez & Dhamecha have worked together to put together a spectacular array of deals that are bound to get you minted! Not only that, there is an exciting competition coming your way for your customers to take part in. This week, we are offering you the chance to entice your customers with Cadburys latest competition. 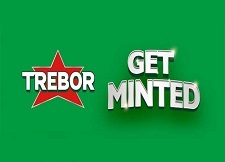 Get Minted, courtesy of Mondelez brand, Trebor, makes it simple for your customers to snap up nearly £5000 by simply finding a winning ticket in any pack of Trebor Extra Strong Peppermint or Spearmint (41.3g), Trebor Softmints Peppermint or Spearmint (44.9g or 100g), Trebor Mighties Mint or Berry Mint (12.6g or 44.5g) (“Trebor Products”) from any retailer advertising the promotion in-store during the Promotion Distribution Period, which begins at 00.01 on 1st April 2018 (‘Opening Date’) and closes at 23.59 on 17th June 2018 (the ‘Final Distribution Date’). For more details on this brilliant competition, take a look at the Promotion terms by clicking here.